The fire which ravaged the historic Notre Dame Cathedral in Paris yesterday has stunned the French for whom it is a national symbol. It was under renovation and at risk with an ancient wooden frame which serves as foundation for the roof, making it ‘incredibly flammable.’ It has survived remarkably over 850 years, through World Wars and religious attacks. 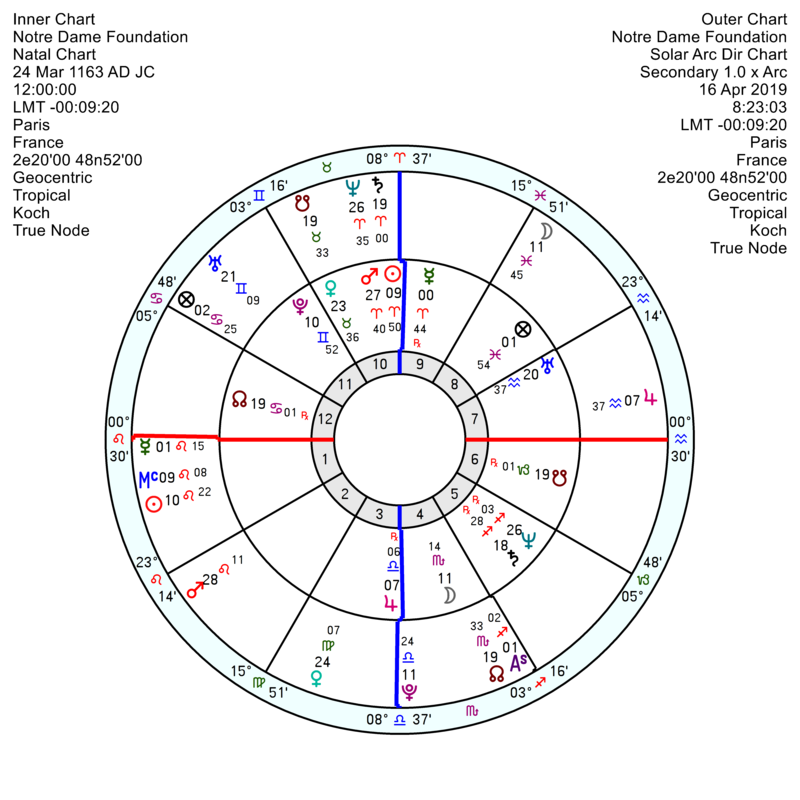 The foundation stone was laid on 24/25 March 1163 JC which gives an expansive Aries Sun opposition Jupiter with an enduring Pluto opposition Saturn. 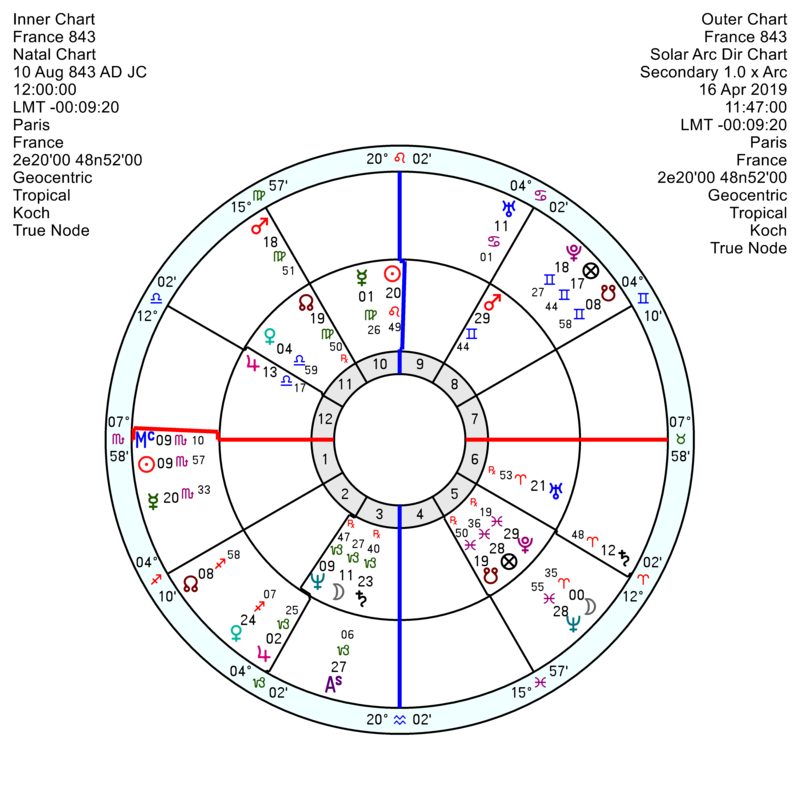 Tr Neptune is squaring the Saturn within a degree which is a neurotic, panicky, dissolving influence; and the Solar Arc Neptune is moving to conjunct the Mars soon which is equally undermining. The Consecration chart of 19 May 1182 JC has Neptune transits to the Sun/Mars midpoint and the Solar Arc Sun. It is moving to a Uranus Return within weeks which does suggest a back-to-the-drawing-board moment and is also a pointer to a rebuild since its Uranus is on the focal point of a T Square with a Saturn opposition Neptune. Both these charts have Cancer North Nodes so they are undergoing a Nodal Return and hitting the Eclipses this year. What is probably even more significant is the France country chart. Often when a disaster of considerable proportions happens in a country, it is a forerunner to great change to come – collapse and rebuild. 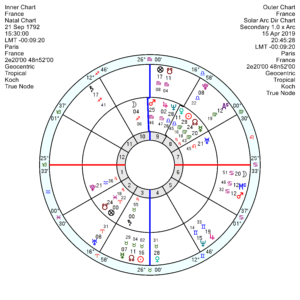 The France 21 September 1792 3.30 pm chart has a good deal of activity affecting its Saturn in Taurus opposition Jupiter Neptune with tr Uranus hard aspects shaking it up last year and this. 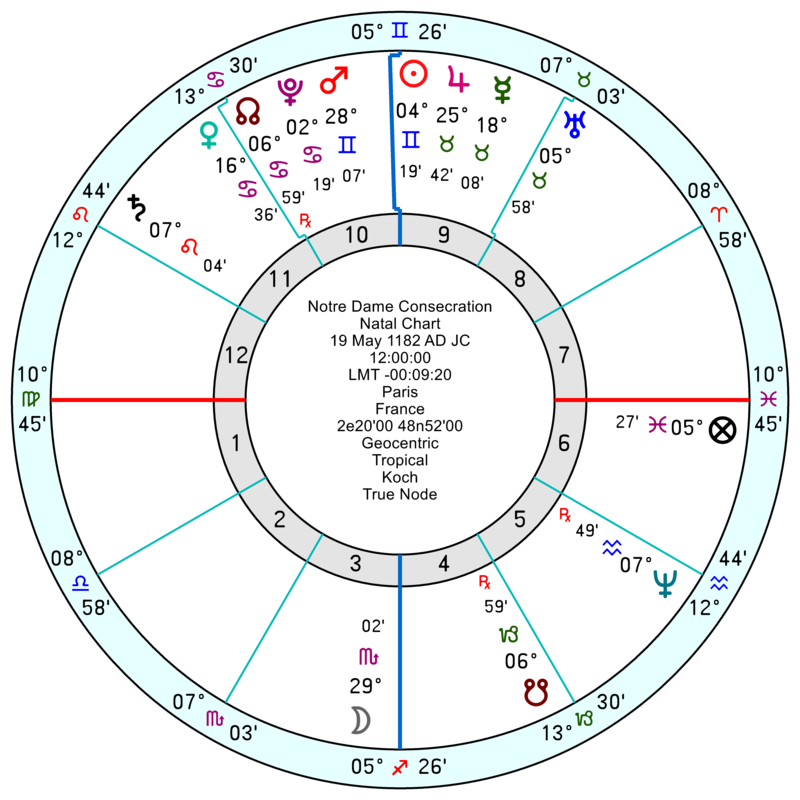 At the moment tr Uranus is square the Saturn/Jupiter midpoint which Ebertin describes, amongst other things, as ‘damage to a building.’ Tr Neptune is also chipping away at the Solar Arc positions of these three planets this year and next. 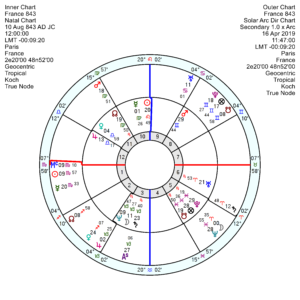 The Solar Arc Midheaven and Mars are also colliding with the Eclipses this year which usually suggests a crisis. 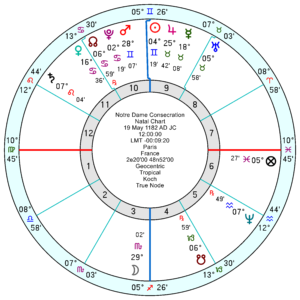 The January Solar Eclipse located to Paris puts Uranus on the Descendant; and the July Eclipse has Uranus exactly on the IC – so it is highlighted as a region for sudden disruptive events. By 2021 tr Pluto will be sextile the 1792 France Mars and then sextile the Midheaven. Given that on country charts soft transiting aspects act like hard, this suggests a three years phase of extreme pressure for change against heavy resistance with a good deal of frustration. 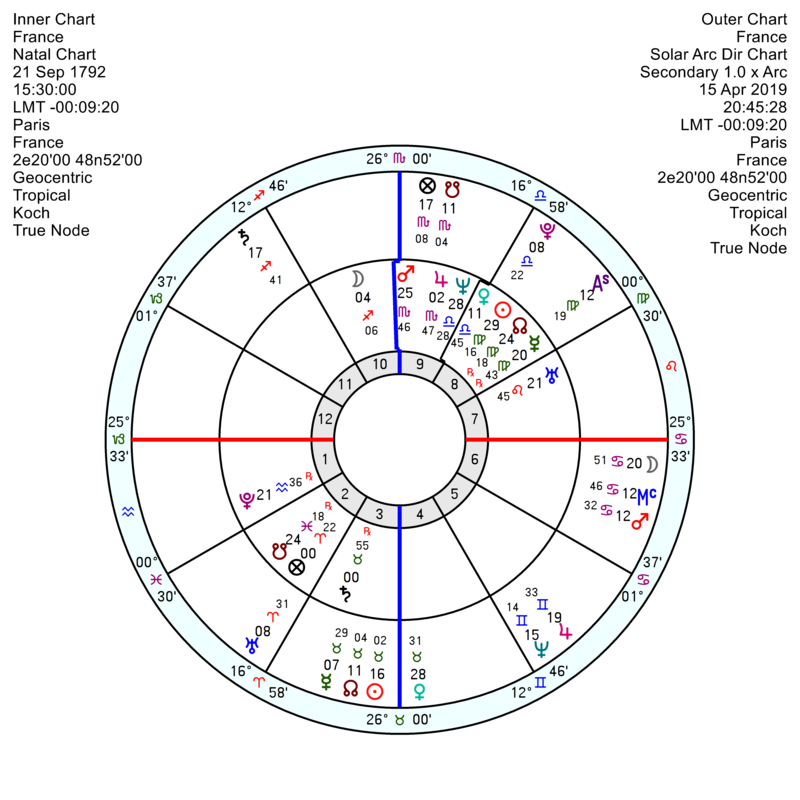 The older chart for France, 10 August 843 JC, is showing even clearer signs of a destiny-changing phase – with tr Pluto Saturn square the Uranus and conjunct the Saturn this year and next; a devastating Solar Arc Neptune conjunct Pluto now, often seen around natural or man-made disasters; and a swampy, scary tr Neptune square the Solar Arc Pluto and opposition Solar Arc Mars this year and next. An early possibility is being examined regarding electrical short being the cause of the fire. Certainly more innocent than a terrorist’s cigarette. It is owned by the French state now I think…so not the Vatican’s responsibility and I will make the point all Catholic churches around the world are funded by the country’s Catholics not the Vatican. Which is perhaps one reason why the Vatican is sitting on such a vast pile of wealth. Kind of agree they should fork out. After all as I recollect HM Queen paid a chunk of the Windsor Castle restoration after questions were asked. On 18 March 1314 (jul) Jacques de Molay, Grand Master of the Templars was executed on the orders of Philip IV by being burnt at the stake on the Ile Aux Juifs, immediately adjacent to Notre Dame Cathedral. At the time of his death Mars, planet of conflagrations, was between 5-6 degrees Cancer. 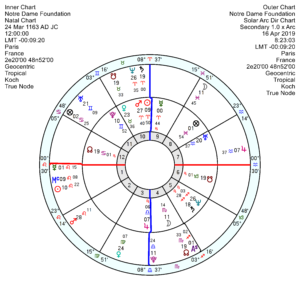 Rather spookily that degree was conjunct the midheaven between 18:40 and 18:45 CEST on 15 April 2019 which is probably about the time the Notre Dame fire broke out (first eye witness reports are timed just before 18:50). As many people know Jacques de Molay famously put a curse on the Pope and the rulers of France as he was dying. I used to be an art history major in college. I was devastated by the news of what happened to Notre Dame Cathedral. However, I’m happy to hear that so many people all over the world have been donating money for it’s rebuilding and restoration. I’m also relieved to discover that many of the religious artifacts and relics had removed from the cathedral prior to the fire. Anyway, I’m donating money to the restoration of Notre Dame Cathedral and I’m optimistic that it will be painstakingly restored. I heard French billionaires Francois-Henri Pinault and Francois Pinault will be pledging $113 million (€100 million) to the rebuilding and restoration process as well. Fortunately, the main structure of Notre Dame Cathedral was spared (even though the interior was gutted). It was the entire roof and spirals that were destroyed. Anyway, they were saying that they plan to hire some of the best architects and art restorers in the world to restore Notre Dame Cathedral. I’m glad to hear that. While its extremely sad that an impressive architecture structure has been burned I think its high damn time the Catholic church put its slimy hands into its $30+ BILLION coffers and forked out the majority of the funds needed for the restoration of Notre Dame. The amount of money raised, especially by the rich, to rebuild, quite frankly, an inanimate object, that will NEVER live up to its original archectural might, as we sit at the 11th hour in the declining environmental landscape is, im sorry to say, truly sickening, and shows the rich folks priorities for what they are; severe detachment from current reality. How would you address & drive the issue as you see it? I disagree with you. You’re infecting your political views into this matter and this is not about politics, this is about preserving cultural landmarks and historical sites. I’m glad people are raising so much money to rebuild and restore Notre Dame Cathedral. I’m also glad people are raising money to restore the three historically Black churches that were ruthlessly burned by a White supremacist in Louisiana too. I’ve donated money to both causes because I’m art appreciator and a history buff. 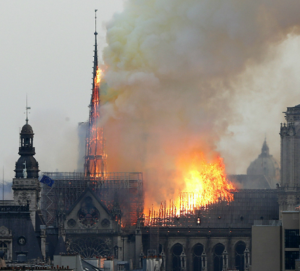 There are not any trees in France that are large enough to replace the ancient Beachwood beams that burned in the Notre Dame fire, Bertrand de Feydeau, vice president of the French Heritage Foundation (Fondation du Patrimoine), told CNN. “The roof was made of beechwood beams over 800 years ago. There are no longer trees of that size in France,” he said. But France has lots of woodland, I’m sure they must have. Altho the country is 1/4 forest…a lot of deforestation can happen over the nearly 1000 yrs of “waiting”. Perhaps in Siberia Far East there are trees of that magnitude. They’re hiring the best art restorers in the world to restore Notre Dame Cathedral. They’ll find a way. I don’t care where they get the wood to rebuild, just as long as they get it. One piece mentioned the original wood came from ‘primeval forests’ which according to wiki comprise ‘trees more than 250 years, with some reaching more than 1,000 years of age.’ Not too much left standing that long these days except in South America. In Europe, there are some in Poland and Belarus I think, but about to get grazed down. Also it’s Oak, not sure any giant Beechwood remains like it did 850 years ago, but there are some in Norway and Sweden. I think they may just use another material now, and first reinforce what remains, as soon as possible before the fires after affects start showing. I think the lost stained glass windows are the biggest loss though. I’m certainly no expert but perhaps beechwood was used simply because it was so plentiful…back then. We have primeval forests here in the States too – mainly in California, Oregon, and Washington State. Such trees in Oregon & Washngton are routinely cut down for power poles. 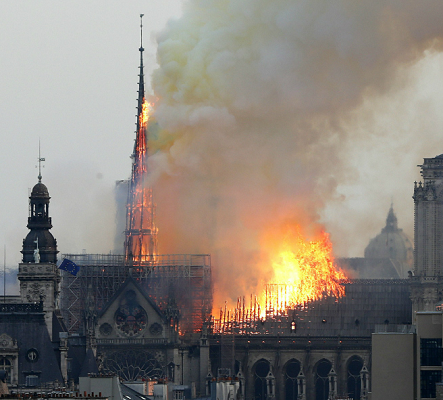 The architect who restored, a gothic religious building of similar vintage suggested the Notre Dame roof might be replaced using a lighter structure of steel beams and titanium panels in place of the oak beams and lead sheeting that were lost. Or even composite structures tho how fire-hardened composites are is but one key question. One of the astro threads online even chimed-in with Nostradamus. Thank you for this Marjorie, leave it to you to find the likely date of the laying of the foundation stone, and so more likely answers to why our history suffered this loss yesterday night. What a true and respectful professional. Ohhh Marjorie, I’ve been feeling like visiting Hugo’s house in Guernsey; I do need a belvedere to contemplate/look properly at what’s going on in the old country…Cancer North Node: it could be a sign of exile for some of us, right?